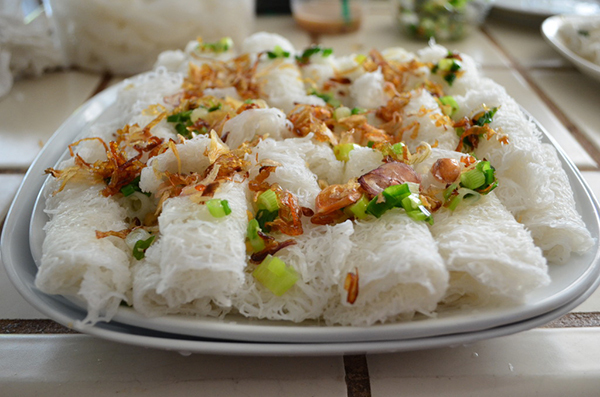 Hoi cake is one of the most popular cakes in the daily lives of Binh Dinh’s residents. The people in Binh Dinh use it every day, and will have it for breakfast, lunch or dinner. However, no one knows how and when it originated, or why people call it Hoi cake. Some elders say that when it was invented, people asked what type of cake it was so many times it became known as Hoi, which means ‘to ask’ in Vietnamese. Hoi Cakes are made in many places in Binh Dinh, but the tastiest is well-known to be at Dieu Tri in Tuy Phuoc. 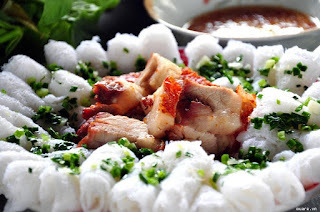 Generally, making Hoi cake is similar to the process used for noodles, but must be done more carefully. Rice is moistened in water to soften it, then husked and made into a fine powder. The powder is then steamed, then stuffed to become blocks. The cake can be eaten right after it is made, but it has yet to be given any flavor. It is often eaten with oil and fried chives to be more fragrant. Moreover, it is used with fish sauce mixed with pepper, sugar, lemonade and garlic.